Odds are you are going to be pretty disappointed with those $10 packs if you buy them one at a time. 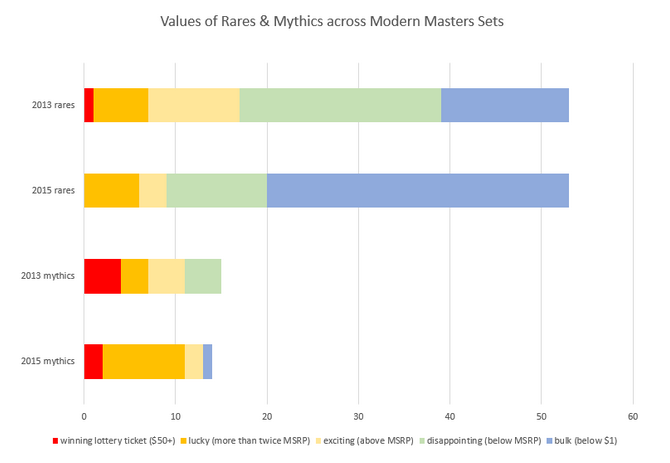 On the plus side, If you’re lucky enough to pull a mythic rare than you have a very good chance of getting your value back and being quite happy – there are many more valuable mythic rares this time around than last time. Thankfully Wizards has learned from the Kamigawa dragon cycle fiasco. Yet, did they really have to put so many bulk rares into a set that is supposed to get Modern staples out there into the market? I realize that we as players want this set to be an amazing limited experience – there’s no doubt that players even until this day still enjoy drafting Modern Masters 2013 and I have friends that keep MM cubes together because reliving the experience is just so much fun. However, I think there is a way to balance this out that Wizards seems to have missed. There is no Gitaxian Probe. That’s right folks, what was probably on the Top 10 of everybody’s guesses at what was going to be printed into oblivion this summer got a reprint reprieve. When I saw Mutagenic Growth and Gut Shot without their blue brethren, my head turned slightly to the side like this. Seriously, huh!?!? Well, that bodes well for the set foil copies that I picked up at $3 each but now I’m wishing I didn’t out all the promo copies that I’ve been acquiring. Thankfully we’re getting Spellskite this time around so everyone can stop complaining about how a card that only sees one or two copies per deck is over $20. Not anymore! We’ll just have to take the good with the bad, like we usually do as Magic players. The set has practically no Limited support for the enchantment-enchantment that is the all star of the Bogles deck. In other words, if you decided to actually, you know, draft the set then God forbid that you open one of these in your pack! Even worse is if you’re stuck with one of these in your GP Vegas Sealed pool! Talk about bad value, at least play-wise. So again, we must take the good with the bad. Ironically, Wizards was okay with just throwing in Leyline of Sanctity to get more copies out there (let’s face it: the card is actually worse than Daybreak Coronet in Limited) while at the same time excluding commons like Serum Visions and Gitaxian Probe. Sigh. That’s a significant amount of mythics currently over $15. But, some won’t stay that way as time goes on – lots of cards are going to drop in price in the short term. Casual hits will drop in price as the market becomes saturated and that will be the time to pick them up. Look at all those terrible, bulk rares. So let me see, besides a lack of commons and uncommons that are within the $2-$4 range, we also have a pretty decent chance of getting Inexorable Tide in a $10 pack? That just seems cruel to people who only buy one pack, Wizards. It is cool that certain cards were downgraded to rare, like All is Dust – so instead of taking up a mythic slot you now have a much better chance of value at rare until the market is saturated. Still though, for every All is Dust there is going to be a Shadowmage Infiltrator, and for every Noble Hierarch there will be an Ant Queen. Since this is Modern Masters, the prices for many of these cards only stand to go down during the short term as more product is released to the market. In summary, Modern Masters 2015 is a mixed bag just like the last one. While last time we received terrible mythics and decent rares, this time around we’ve gotten great mythics and mostly bad rares. To be fair though, they are only bad if we categorize them all as tournament staples – there are plenty of casual targets in those rares that are bound to go up once their price bottoms out such as Creakwood Liege. Like Warren Buffet (and Sig! ), we should find opportunity where others find woe. Look for the diamonds hidden the rough that will grow over time due to non-Modern demand. Also, even though there will be some bumps in terms of Sealed Deck play, this format looks great for Draft! My friends and I are going to love building and playing with a Cube of this set, and drafting fresh packs will surely lead to many memorable games. I haven’t done the expected value per pack calculations on the set yet, but I’m guessing that the math will show that EV is going to be equal to MSRP in the short term when more than just the mythics and rares are considered (even with all the non-inclusions at common/uncommon). Singles might drop, however per pack players should be, on average, pretty satisfied with their pulls, especially since there is a foil in every pack. Plus, the mythics might not drop all that much if the set is scarcer than Wizards has led us to believe. Wizards is very good at pricing these types of products based on market research, so if you open a ton of packs right way you are bound to at least make your money back if we bring the commons and uncommons into the equation (thanks James Chillcott for the insight!). What are your big targets from this set once the prices start to nose dive? Mine are Emrakul, the Aeons Torn, Kozilek, Butcher of Truth, Cryptic Command, Noble Hierarch, and Creakwood Liege. Great article this week – you’ve precisely captured the disappointments of the set. I appreciate your attempts at optimism, but my general attitude is that I probably won’t open a single pack of this set beyond my 6 packs at GP Vegas. The variance is just far too high and I’m not that kind of gambler. Honestly, I’d rather throw my $10 on a game of black-jack or, better yet, craps, for a better chance at making more money back. I’m flattered you’d use Warren Buffett in the same sentence as me :). Same here. In a way, I am quite glad that I would not feel obliged to fog up a good chunk of cash to buy a box or two of Modern Masters if I had the fortune to once again stumble upon an obscure shop that is selling them at MSRP. Just the 6 packs I would be cracking at Chiba. Is it worth to buy a MM2015 box for 150e and sold later? Probably. There are no guarantees (it could go the way of Conpiracy that everyone thought would be a great thing to buy and hold) – it’s really all about print runs and no one knows exactly how many boxes are out there. Good overview of Modern Masters. I like the notion of picking up the casual stars when they bottom out. Doubling Season is now double the price it dropped to when Modern Masters 2013 came out. Also, I have the feeling that the long-term value of Modern Masters 2015 boxes are going to be higher than expected. Mainly because of the number of casual staples in there like the Eldrazis, their associated cards, Karn which overlaps as tournament staples as well. +10 Guo Heng Chin for name dropping Doubling Season. I love that card!!! Picking up Casual Stars when they bottom out is a very good goal to have. I’m a fairly casual player and my top pick is Wilt-Leaf Liege. It has made it into modern decks which sent the price skyrocketing from its Casual/Commander price. It should drop back down a lot due to the reprint and being a rare. This card will always have demand in my opinion and I almost bought one at its peak price simply because I wanted one for my commander deck, not for modern. I’m glad I waited for spoilers and the price drop, but I think Wilt-Leaf Liege is headed right back UP-UP-UP once it hits the floor. Very true, especially if Abzan continues to be a thing in Modern. Voice of Resurgence is also a nice target from this deck. As a collector/investor I’m mostly happy with the Modern Masters 2015 spoiler and set…mostly because a lot of cards I expected to be reprinted weren’t (Goblin Guide, Chalice, Blood Moon, Gitaxian Probe, Spell Snare, Serum Visions etc). As a player most of my Magic friends and I are pretty disappointed with the set. Fate-Khans and Dragons-Fate limited is bomb or bust, MM2 seems similar or it seems to be “avoid opening unplayable rare and pray to open a mythic”. The only good thing is that most mythics are difficult to cast or combo with in limited so you might make money but not autowin a draft or sealed event. But there’s so many awful rares to open and at $10 a pack I’m going to guess $35-45 is going to be the cost for draft…you could draft correctly, win a draft, and then still LOSE monetary value as no draft I know rewards players with MM packs. And there just seems to be so many senselessly reprinted and uncastable rares like Horde of Notions, Niv-Mizzet, Ghost Counsel etc. I’m mostly worried that limited will be “build Affinity”and hope to open or draft the blue cards to go with it or lose. What are your limited thoughts or are you purely a collector/investor? I’m mostly looking at this set from a financial perspective, but I think that limited should be pretty fun! I think that there will be plenty of good archetypes to choose from when drafting the set. They’ve said Augusts FNM promo will be a modern staple. I’m expecting it to be Serum Visions. Glad I didn’t buy into the booster box craze. Would you say through the breach would be a good pick up with the influx of eldrazi? Yes, Through the Breach is a pretty good pickup since it also dodged a reprint and will always get better with the creature creep (such as Eldrazi) that tends to happen with Magic. I think an argument could be made that, overall, the price loss on cards reprinted in MM2015 is comparable in size to the upwards swing of other Modern staples that “dodged the reprint”. Wizards now has us begging for reprints instead of new content. You win again, Wizards! I think if they had flushed out the rares like they did last time, they could NOT pursue the Mythic lineup they present here at the publicized price point. What does it do for the the brand? What do you think is likely to happen to, for example, mythic or rare staples prices, if this set is not as “attractive” as it first looked? My feeling is the market will overall be quite overflooded with more Goyf’s, Clique and Karns…but would it be so much that their respective prices will plummet? ps : what do you think about Foil noble Hierarch (conflux French) price? Is it likely to be affected by the reprint? If the set isn’t attractive enough, then fewer mythics will be opened and prices will take longer to decline. However, due to events like GP Vegas, Wizards has made sure that the prices will decline by having players open thousands (if not hundreds of thousands) of these packs at the same time. So my guess is mythics will decline in a shorter time frame, and then bounce back up again in the long term. 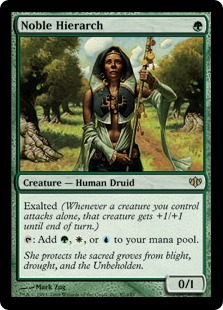 As for Conflux Foil Noble Hierarch, the price should be safe from a reprint. In fact, it could go up if players start demanding more copies of Noble Hierarch in general. See the original Onslaught foil fetchlands price history. The same argument could be made for Noble Hierarch.